Our town centres are the heart of our communities. Our CBDs are social history mirrors and their change and vibrancy tell a tale. When founded 145 years ago (1873), Hastings was undoubtedly raw and fledgling. Its history of booms and busts is mainly a story of growth, renewal and fresh investment in businesses, buildings, orchards and farms. Significant events include the 1931 earthquake, which claimed numerous remarkable Hawke’s Bay buildings. The district today is booming. The Park Mega Centre Hastings portfolio very recently sold to a Wellington couple for an eye-watering $21 million and 6.47% yield. The 1950s, 60s and 70s were hyper-successful for Hastings. In 1951 Alan Berry began his career as an accountant in Russell Street North. In 1969 pharmacist David Hughes started practice in central Hastings. Both retired professionals have contributed to this story. In those golden days farming, horticulture, and their related industries and services were big drivers. The same is true today, but central Hastings’ and Napier’s commercial make-up is distinctly different. Before the 80s, livestock sale-day on Wednesday, as well as Friday night activity, brought country people into Hastings. Hospitality, retail and the service businesses were in full swing. The town rippled, beer and cash flowed freely. Hastings CBD had seven stock and station agents: Dalgety & Co, NZ Loan & Mercantile, Williams & Kettle (ASB corner and SBS opposite), Hawke’s Bay Farmers (IMS Building), de Pelichet, McLeod & Co, and Murray Roberts & Co, which was assimilated into Wright Stephensons. They provided services to the rural community including grocery. The Hawke’s Bay Farmers’ Queen Street garage serviced cars and sold new ones, including the 1920s Buick Master Six. The Gardner & Yeomans’ timber mill was located where Spotlight is today. The Tourist Motor & Farming Company garage stood where Kiwibank now stands. In the 1950s and 60s, Queen Street was a short stub and did not cross the railway. The shunting yards stretch from Heretaunga Street to Watties caused St Aubyn Street lengthy delays when freight wagons were worked to make trains. Rural road transport firms in and around the CBD included: Sherwoods, Mills (Countdown), Wilkies and Powdrells. They could not carry goods or livestock more than 64 km (40 miles), because of laws protecting government rail transport and railway jobs. By the 1960s and 70s there were 11 pharmacies in Heretaunga Street and at least a dozen standalone menswear businesses in Hastings. Friday night shopping was until 9pm and the city centre hummed. Heretaunga Street and nearby hotels in that era included: the Hastings Hotel beside the town clock tower, the Pacific, Albert and Grand, The Carlton Club, The Mayfair and The Stortford Lodge. They were supplemented by at least five chartered clubs including The County Club and Hastings Club. In the 1970s, barn type pubs took hold in the CBD and elsewhere – the Angus Inn, the DB Heretaunga and DB Te Mata. 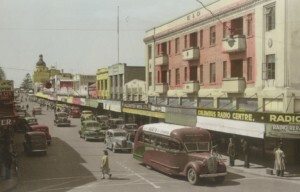 Hastings CBD department stores included Westerman’s, Roach’s and Bon Marche. Heretaunga Street was a busy west-east thoroughfare. Traffic backed-up giving way to more frequent trains late on Friday afternoons and at other times. 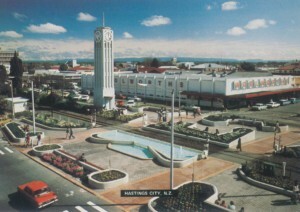 This chaos by the 1970s prompted the main street rail-crossing closure and a ring-road, followed by the 1980s partitioning of Hastings with the pedestrian-only mall and a reformatted fountain. Much as they are today, Hawke’s Bay CBDs were places for business, shopping and recreation. They were energised by social interaction. Retail needs were mostly met in the town centre. In modern times supermarkets and Large Format Retail (LFR) located outside CBDs meet an array of shopping needs. Napier has partially resisted, Taupō has prohibited LFR outside the CBD, and Hastings has kept LFR semi-central. Stock agency brands are considerably fewer, and current-day rural retailers are remotely located. Businesses that have long since moved out of the heart of CBDs include bus depots, garages and car dealerships, cartage firms, grain stores and timber mills. Today, inner-city people traffic revolves around small shops or modest scale speciality retail and hospitality. Farmers department store is the only major space retailer that regularly swims against the tide by locating in CBDs. In 2003 Turley & Co intensively surveyed Napier’s core CBD composition, and again in 2015-18. Some recent hype around changed inner-city property uses is unfounded. The surveys confirm hospitality and cafes is unchanged at 14%, and banking and finance at 5%. Fashion accounted for 32% of shops in 2003, and 15 years later is barely diminished at 29%. The most significant change for central Napier is the escalation of national and Australasian retail brands from one-third to just over a half. Shop numbers overall are almost unchanged. 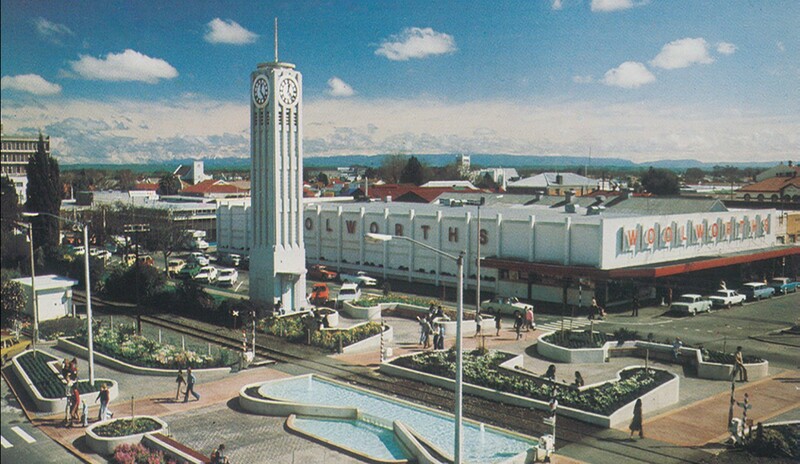 By 1995 Napier had controversially established a new CBD format. The city abandoned a traditional model whereby cars could park right outside main street shops. Napier created a people-centric CBD with ample off-street parking and multiple foot-traffic access points. The heart of Napier has not looked back and its inner-city vibrancy is self-perpetuating. Napier City prime retail rents are 40-50% higher than Hastings, and Napier pedestrian numbers are superior. In the last 10 years, the top three main street Napier foot-traffic survey points have declined only 4%, which is impressive in the face of big-box and online retail. Pedestrian numbers for Hastings’ best three main street locations have declined 34% over the same period. Hastings’ best retail site re-leased in 2016 at 17% below its prior rent. Relative rent determines property wealth and underpins new buildings viability. 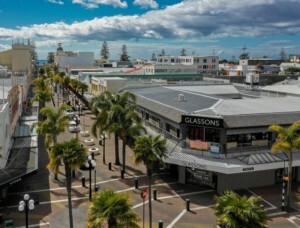 Napier’s 460 metres Emerson Street is 80% people focused. In contrast, Hastings’ main street is two-thirds focused on cars, and in the mall, cars are prohibited. The mall and fountain with the railway create an east-west wall that solidly partitions the heart of Hastings – for three decades. The rail-crossing and mall, and possibly Railway Road, should be re-opened to one-way car traffic through to Market Street. This format could be adopted for the main block with replacement off-street parking very nearby. The silver-lining is Hastings District Council is looking at the CBD and rethinking what might work best for the future. The HDC has allocated $4.5 million for CBD reworks and betterments. There may be further funding for land acquisitions. The Council is consulting and taking expert advice from inner-city design specialists. It could be an exciting new era for central Hastings. CBDs, like shopping centres, require format and design adjustments to remain current, relevant and successful. Competitive pressures are significant, and when it comes to town places, people generally vote with their feet, and businesses follow. For town centres, it is either a downward spiral or a self-perpetuating upward cycle. 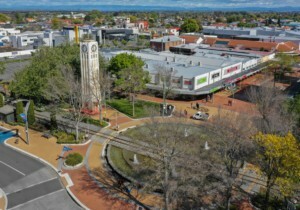 Palmerston North has developed a city master plan that recognises the significance of inner-city success, which has spinoffs for its broader urban area and region. The city will invest $31 million over the next six to eight years in CBD reformatting and streetscapes betterment. Its population at 87,000 is 1.1 times that of Hastings (80,000). However, its CBD budget is 6.9 times greater than Hastings’ $4.5 million CBD budget. Social history and success will continue to be mirrored in the hearts of towns. The vibrancy of CBDs contributes significantly to the confidence and reputation of communities, and the relationship between these things is intertwined. In the face of modern retail changes, and decentralised offices, CBDs need to be strong social and people-centric town places. Today I would have to say, Napier’s got it right; Hastings’ inner-city risks being locked in a downward spiral.